We have now entered an era with a new digital revolution, namely, the Internet of Things (IoT). The digital revolution marks the starting of information age. We use the Internet nearly every day. The Internet has turned out to be one of generic ways for us to work together, to share our lives with others, to shop, to teach, to research, and to learn. But the next wave of the Internet is not about people. It is about Things, really? According to the report by Goldman Sachs, IoT is believed to be the third wave in the development of the Internet, and may be the biggest one. IoT is defined as the network of physical objects that can be accessed through the Internet. These objects contain embedded various technology to interact with internal states or the external environment. According to the McKinsey report, IoT is defined as “the computing systems of sensors and actuators connected by networks, where the computing systems can monitor or manage the status and actions of connected objects and machines, and the connected sensors can also monitor the natural world, people, and animals.” The core of IoT is not simply about connecting things to the Internet. It is about how to generate and use the big data from the things to create new values for people, and about how we enable new exchanges of value between them. 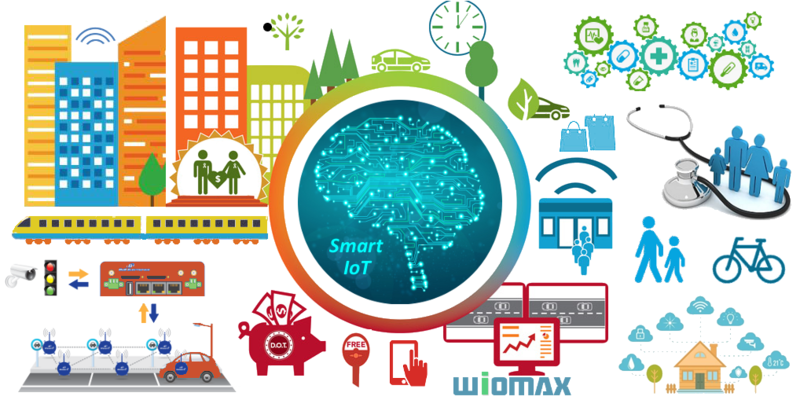 In other words, when objects can sense and communicate, IoT has its intelligence to change how and where decisions are made, and who makes them, and to gain a better value, solution or service. Central to the value of IoT is in fact the Internet of smart things (smart IoT). Supported by intelligent optimization, smart IoT can increase productivity of work and enhance quality of lives for people. Let us take “cities” — the engines of global economic growth — as an example. Smart cities have the potential to dramatically improve the lives of everyone. In intelligent transportation systems (ITS), smart IoT can not only monitor the status of the transportation, but also optimize traffic signal controls to solve traffic congestion and provide the travelers with better routes and appropriate transportation information, etc. Combining IoT and machine learning (ML) can also make our roads safer. Benefits from smart IoT have been displayed as well in healthcare, logistics, environment, smart home, in the aspects of better quality, energy conservation, efficiency increase, etc. Smart IoT is still in its infancy now in terms of the technology development and the impact on our global economy and our daily lives. Most IoT data are not used currently in the era of big data. Most IoT has no intelligence in the era of artificial intelligence (AI). The IoT that are used today are mostly for anomaly detection and control, rather than optimization and prediction. Given the tremendous anticipated growth of the Internet over the next 10 years, it is one of critical challenges and opportunities for us to invent and practice in real-world applications on how to make the IoT smarter to generate the greatest value.